Lottie sailing to Island Harbour for the Trident Owners Rally August 2014. As usual its a rushed job again with lift-in booked for April 7 (Easter Saturday) and too many other distractions ashore. Thankfully the paint job on the underwater metalwork seems to have worked relatively successful in 2011 so not too much prep work required to do the essential underwater tasks – which are all we are likely to achieve before the crane comes. 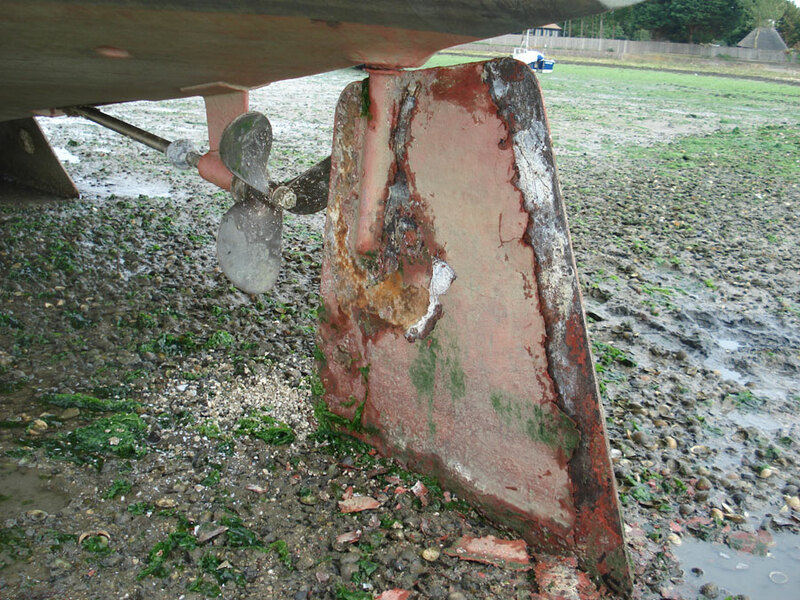 In 2010 we fitted extra anodes to the bilge keels and rudder with apparently disastrous results. 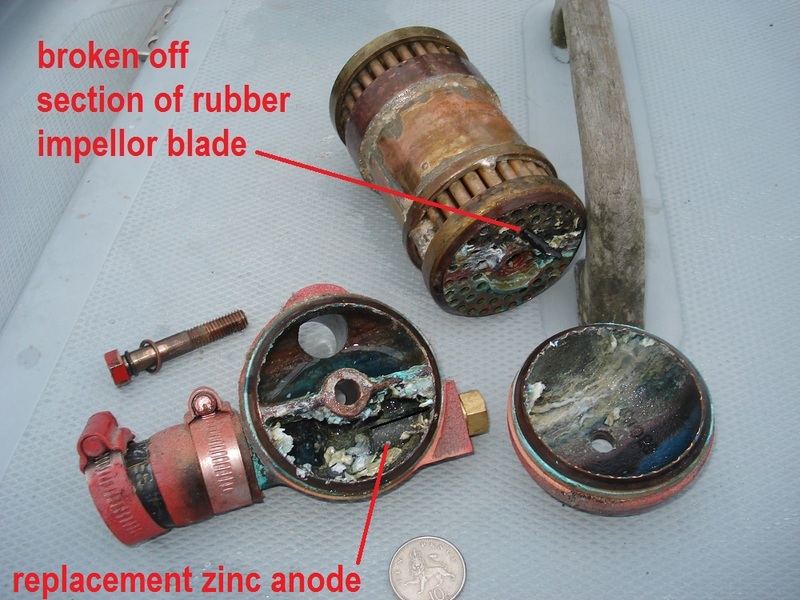 The paint just fell off as if the metal was fizzing with too much galvanic action. 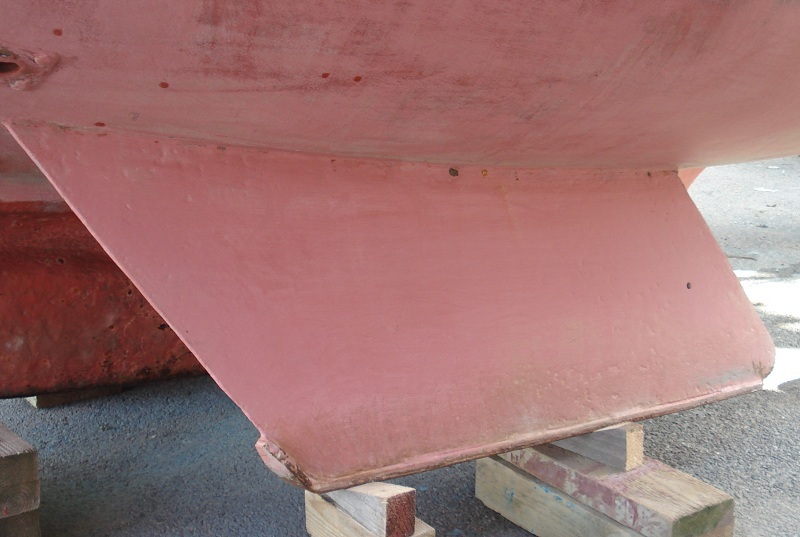 After stripping it all back in Spring 2011, treating with Fertan rust converter and five coats of International Primocon and the usual Cruiser antifouling, the paint on the steelwork looked almost pristine after a wash down in November. More gory details here. 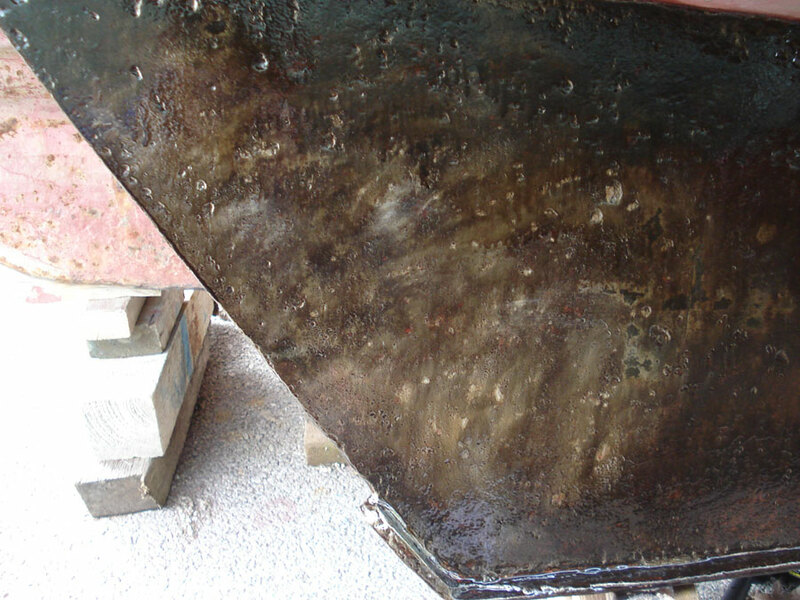 The Beta’s diesel engine’s heat exchanger was long overdue for a clean out – the rubber pump impeller having shed a couple of rubber blades which disappeared into it and the engine anode completely dissolved – or rather turned into white sludge clogging up the tubes in the copper exchanger stack. 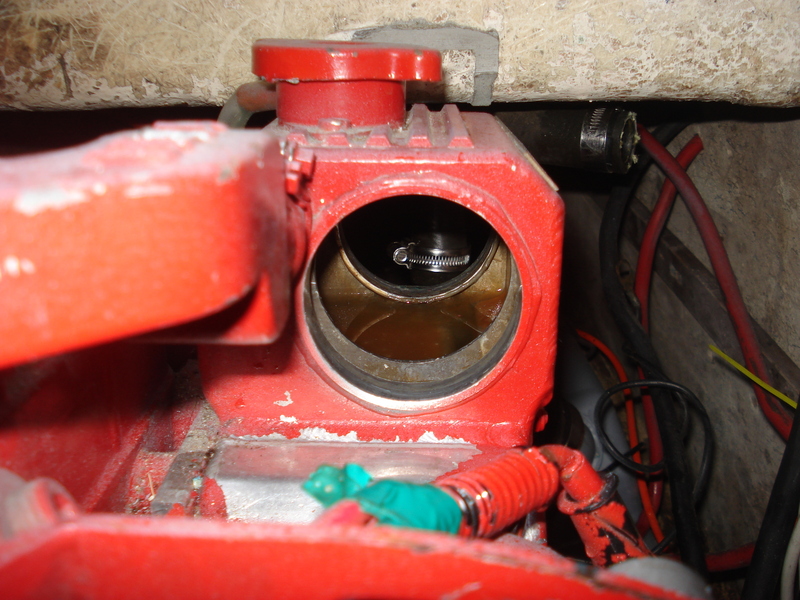 And of course the oil and filter needed changing and the impeller checking. 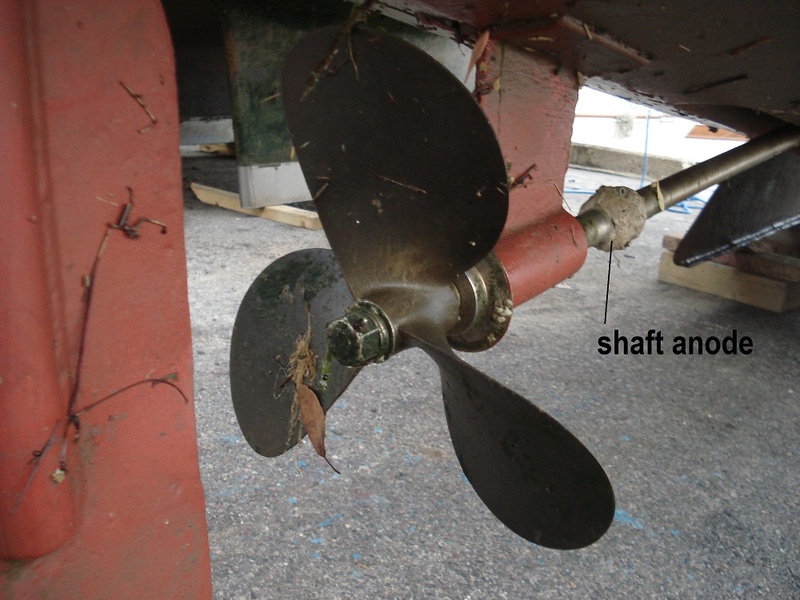 The prop shaft anode just about lasted the seven months Lottie was afloat last year but will need renewing before launching. Fortunately we got some at giveaway prices on e-bay last year though one is a 25mm rather than 1″ and may need a little persuading to fit the shaft. 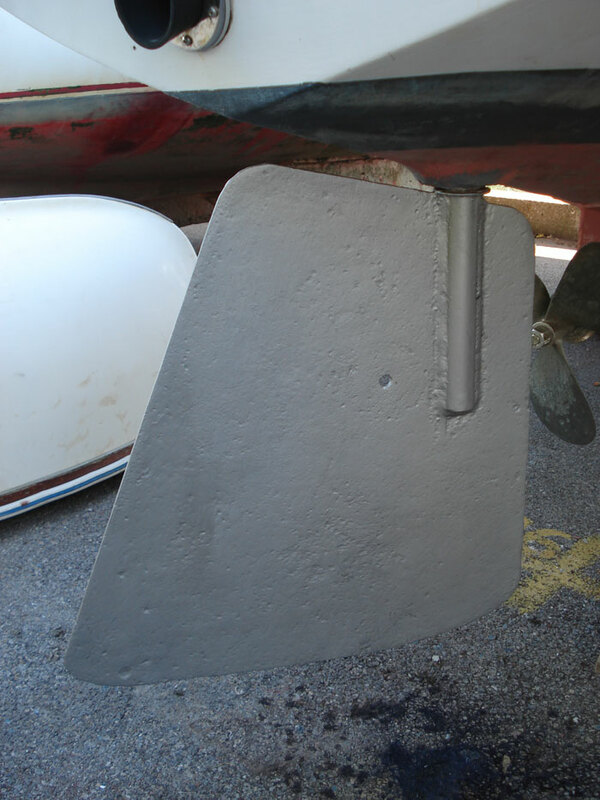 And giving the prop a bit of a scrape and scrub from the dinghy in July meant it remained clean for the rest of the year, unlike in previous seasons. 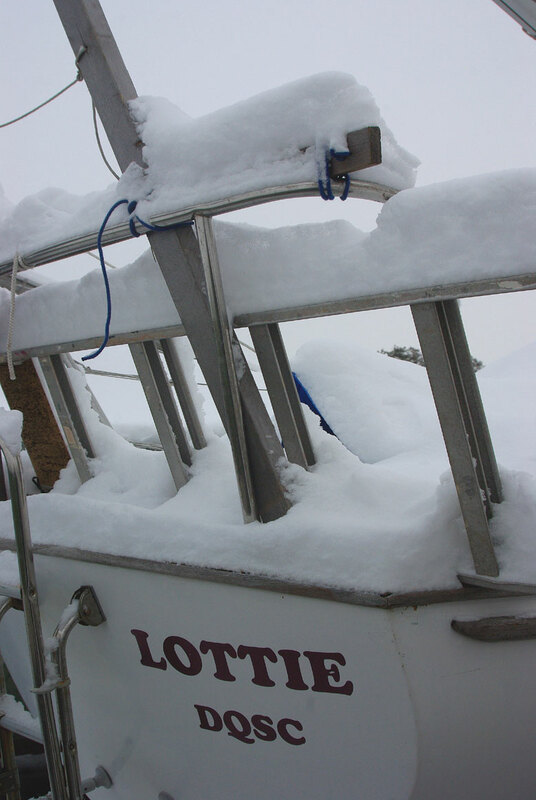 Lottie’s winter cover seems to have survived and done its job through all the gales and storms. All the steel below the water line has been wire brushed back to steel/rust, coated with Fertan rust converter and is now in process of getting 5 coats of Primocon. 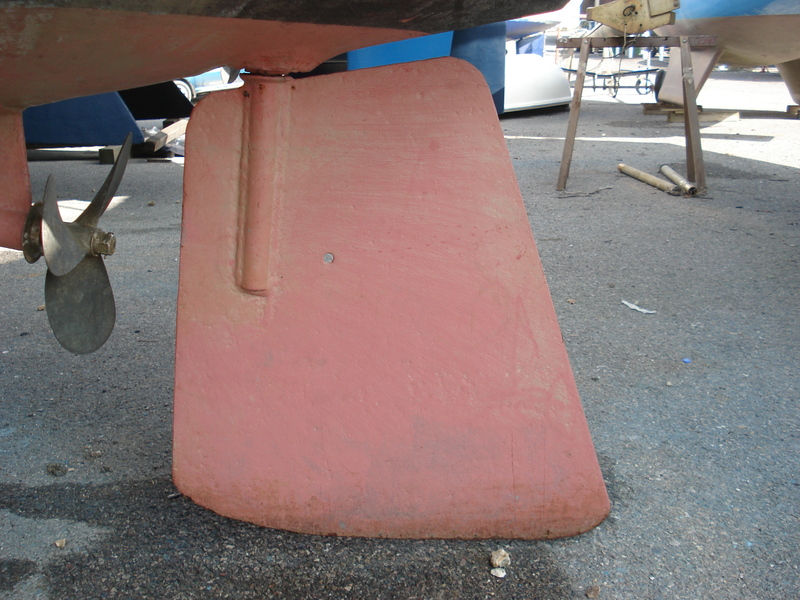 The ballast keel also been similarly treated (though not stripped right back to bare metal). 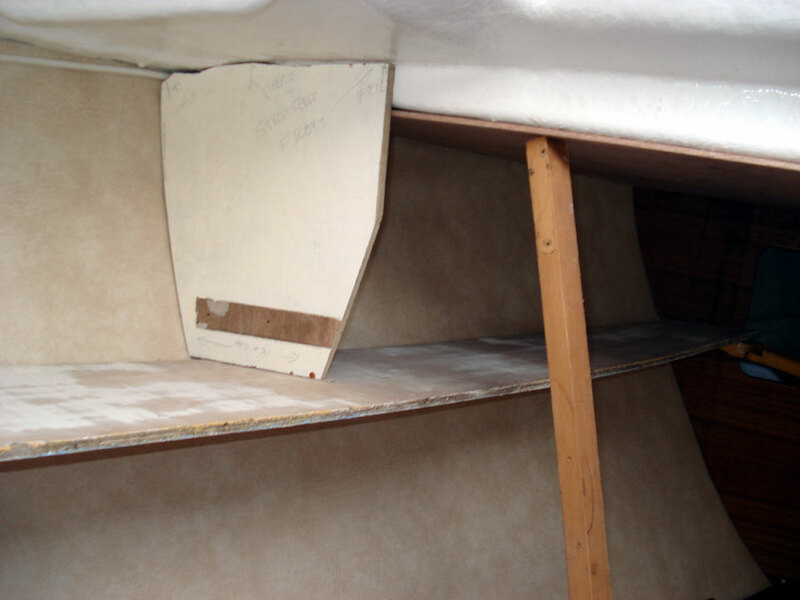 In the forecabin, ceiling boards have been shaped (6mm WBP ply) to line under the foredeck with vinyl. The old locker floors have been offered up and reduced in size ready for new teak faced underdeck locker fronts to be made. As a result of making a few enquiries of likely contacts in the Fareham area, Ben Benstead very kindly rang up. He was the original builder of Lottie (or Stella Maris as she then was) and was able to solve a few mysteries. Ben (now 85) owned her from 1970 until 1982. 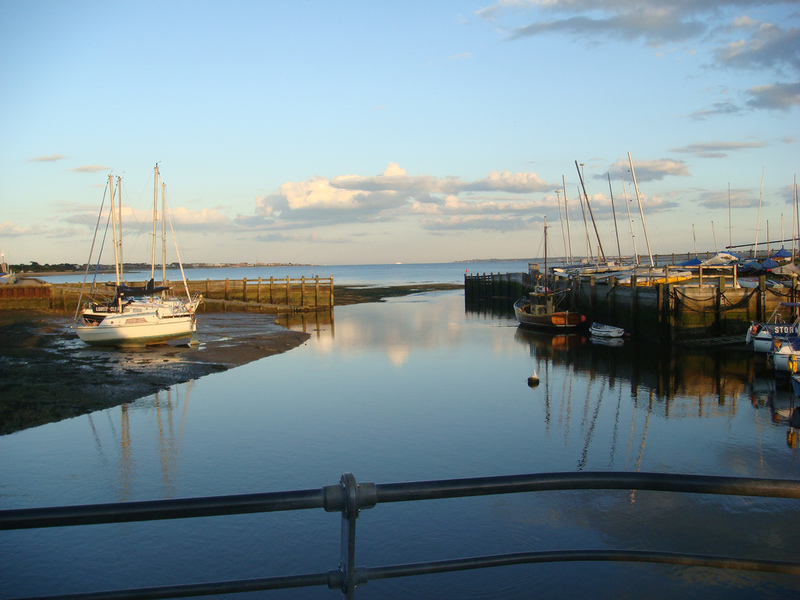 She was based mostly at Hillhead Haven on the East side of Southampton Water near Titchfield and the River Hamble. It looks nice. Apparently Hillhead is limited to craft of 25 feet or less. Adrian Pink (Beardy Vulture) , SailsteveUK and Amanda Rudkin have very kindly agreed to the use their Flickr pics on this site [click to enlarge]. I’ll soon be putting up a gallery of Lottie’s previous Home Waters. Meanwhile, there is now more practical stuff about epoxying the hull, fixing the leaks in the hull/deck joint and fitting the new toerail and taffrail. Lottie‘s Log is not really a blog. But from time to time there will be updates here on what’s new on the site and what is happening on board Lottie. 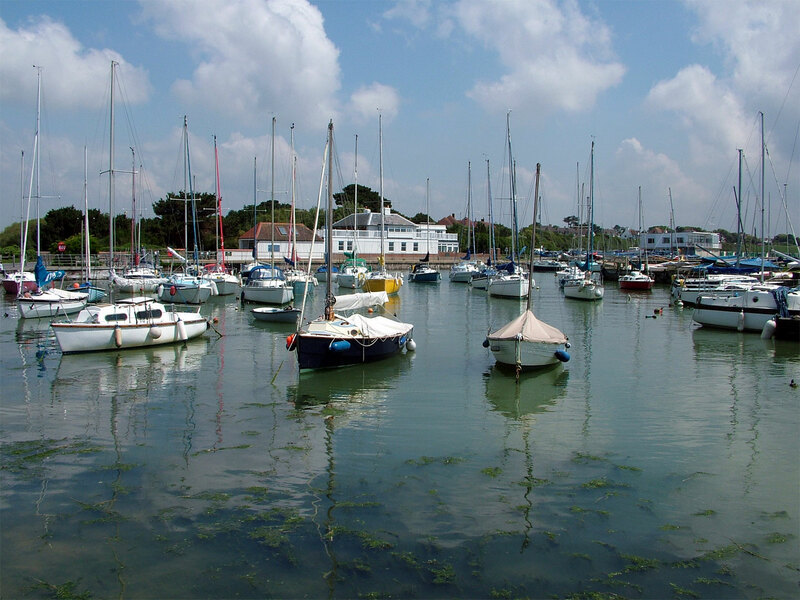 The newest additions to the Log are some pictures of Lottie’s home waters in Chichester Harbour. Many thanks to Jon Reed, owner of the Trident Spin for the use of some of his excellent shots. 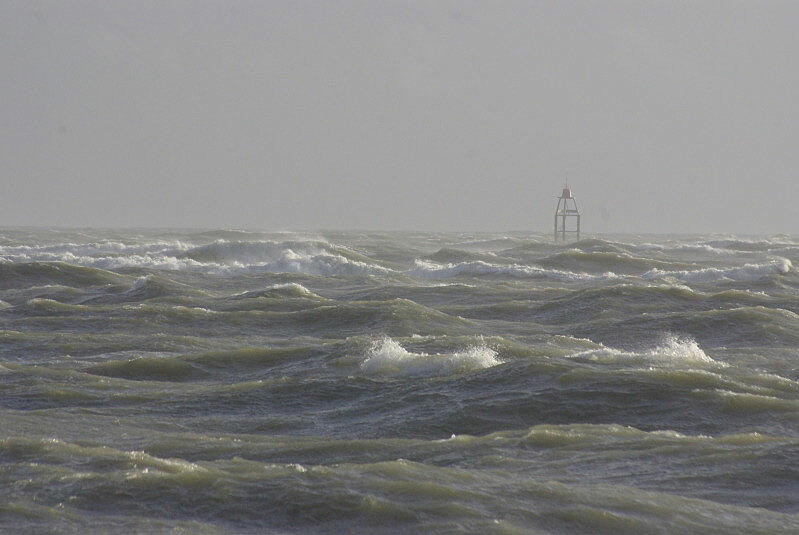 Jon took the photo of Chichester Bar in 50knots of wind above. More pictures to come soon on Home Waters and Crew pages. Lottie is nowhere near the Bar at the moment of course. 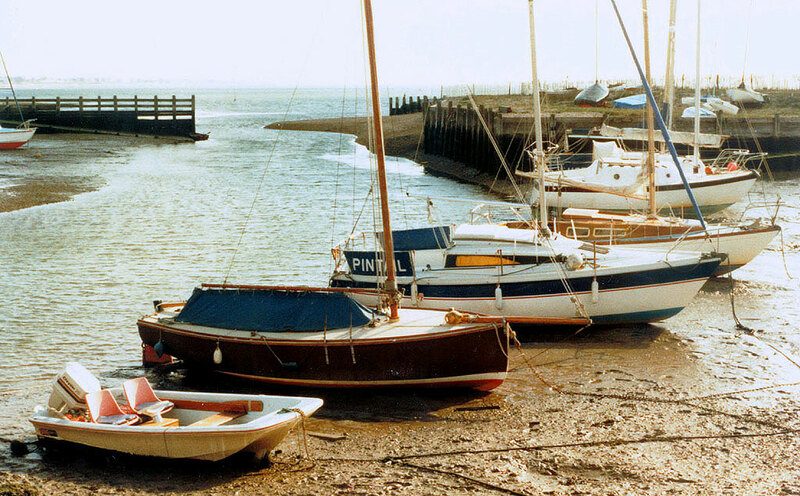 She’s laid up ashore with her mast stowed, her cover on, her canvas at home warm and dry and her batteries on charge.